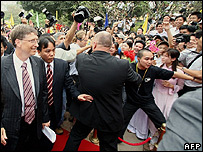 Bill Gates has been greeted like a pop star by thousands of university students during a visit to Vietnam. About 7,000 students waited for hours, some clinging to trees and balconies, to get a glimpse of Mr Gates during his visit to the Hanoi university. "You represent the future," the world's richest man said during a speech, "the future of invention and technology, the future of this country." He had earlier met Prime Minister Phan Van Khai and President Tran Duc Luong. The audience at the Hanoi University of Technology cheered and gave Mr Gates, 50, a standing ovation after hearing him talk about future hi-tech projects such as tablet computers and mobile phones more powerful than today's desktop computers. "He is excellent and successful," 21-year-old student Do Yen told AFP. "He is my idol. I hope that our country will have someone like him in the future." Prime Minister Phan Van Khai and President Tran Duc Luong had earlier taken time away from the ruling Communist Party National Congress, the most important event on the political calendar, to meet Mr Gates. Under an agreement signed Saturday, Vietnam's Finance Ministry became the country's first government office to use completely licensed Microsoft software. A statement said the agreement "reaffirms the government's commitment in copyright protection as the country integrates into the international community", Reuters reports.